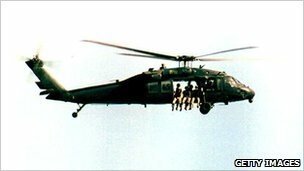 The sole survivor of one of the US Army Black Hawk helicopters shot down by Somali militiamen in Mogadishu in 1993 says the deaths of 18 of his comrades should not have prompted the end of the military mission to restore order. Pilot Michael Durant told Radio 4′s Broadcasting House that today’s famine can be traced back to that decision to withdraw. “I’d describe it as hitting a speed bump in a parking lot going 40mph (64km/h),” says Mr Durant, describing the moment his Black Hawk helicopter was struck by a rocket-propelled grenade fired from a Mogadishu street 70ft (21m) below. Amid loud whines and bangs, his aircraft “began to spin… rather violently”, he says. It was 3 October 1993, and Mr Durant’s Black Hawk was taking part in an operation to capture close associates of the local warlord Mohammed Farah Aidid. Since the fall of Somalia’s government in 1991, Mr Aidid had been waging a bloody clan war and hampering United Nations efforts to deliver relief supplies to a civilian population facing starvation. Thousands of US troops were originally deployed to help bolster security for aid organisations, but soon resorted to force to bring Mogadishu’s militiamen to heel. Mr Durant’s superiors had expected their elite troops to complete a lightning assault on a hostile quarter of the Somali capital lasting just 90 minutes, but the plan unravelled as helicopter after helicopter was struck by ground fire. Mr Durant’s craft was the second Black Hawk to crash. The impact broke his femur and injured his back. “When I regained consciousness, I realised that we were in one of the poorer parts of the city. Tin shacks,” he says. “Initially there was not a lot of activity, but then two Delta Force commandos came in to our aid and we realised that the enemy had determined our location and they started to try to overrun us. “It was a huge gun battle. They say that 25 Somalis were killed by gunfire at crash site two, so that gives you some insight into how much shooting was going on,” he adds. The pilot says it was “clear to me that we could only hold out so long with limited ammunition”. The Americans were eventually overwhelmed. “I was the only survivor. We lost the whole crew and both Randy Shughart and Gary Gordon, the Delta commandos,” he says. Mr Durant’s life was saved when a gunman recognised that the flyer might have value as a prisoner. “He got the situation under control by firing shots in the air, pushing some people aside and stopping the chaos just long enough to get me in captivity,” the pilot says. As Durant was being spirited away, his comrades were still engaged in fierce street fighting, first to reach the two downed helicopters and then to force a passage through the hostile neighbourhoods to safety. In the course of a 17-hour battle, it is thought that hundreds of Somali fighters and civilians died. A total 18 US servicemen and a Malaysian soldier from the UN were killed. Some of the American dead were carried aloft by angry crowds. “Hate is such a strong word… but anyone who would drag my comrades through the streets I would find it difficult to forgive them under any circumstances,” Mr Durant says. As a prisoner, Mr Durant was treated with “hostility across the board”, but as the hours stretched into days the badly injured pilot found that some of his captors showed him some compassion. “They did some things that were above and beyond, as I would describe it,” Mr Durant says. “The conditions and the food and the water in a situation like that are horrific. I suffered diarrhoea, and being immobile it created quite a mess,” he adds. “That’s a difficult think for another man to assist with, but one of my captors generously assisted me in cleaning up and caring for myself,” he says. Mr Durant was released after 11 days, but his ordeal, the deaths of so many of his compatriots and the shocking TV pictures of the battered corpses, had a sobering effect on public backing for continued US involvement in Somalia. Within six months of the Black Hawks going down, the American forces were gone, soon followed by the United Nations troops. “Without exception, those of us who were on the ground, who fought in that battle, strongly oppose that change in policy,” Mr Durant says. “And I do believe that is a big factor in why we continue to struggle with Somalia and why it struggles itself. We had an opportunity to implement some change back in 1993 and we allowed that window of opportunity to close,” he adds. As a keen follower of events in Somalia, Mr Durant says he finds the current famine troubling. Mr Durant says there are “limits to what we can do” in Somalia and questions remain over whether a US military force is needed in the country. “Number one: do we have the resources to do what’s necessary? Number two: can we accomplish the mission?” he says. 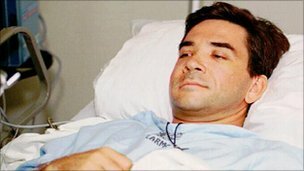 Mr Durant returned to flying once his injuries had healed, and clocked up thousands more flight hours before he retired from the US Army in 2001. Given his level of skill and experience, would he return to Somalia to fly in aid if the opportunity arose today? “You caught me off-guard with that one,” Mr Durant says.